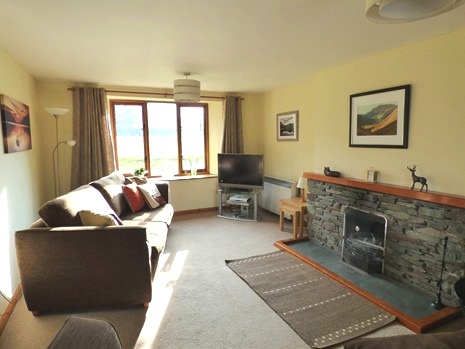 Our family friendly Lake District holiday cottage is in a stunning rural location in the heart of the Lake District. The cottage is located in the quiet unspoilt village of Hartsop, next to Brotherswater and just minutes from Ullswater. Our traditional Lakeland stone built cottage is a real home from home. Downstairs there is an entrance hall with downstairs cloakroom and w/c. Turn right into our fantastic light and airy family living room, with two large sofas, an open fire, satellite TV, and fell views on both sides. The modern kitchen is to the rear with all you’d expect including a dishwasher. 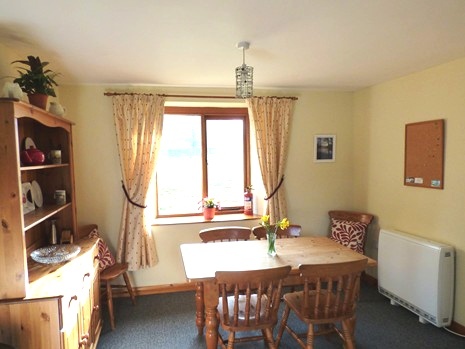 There is also a dining area with a table and chairs, and views to the fells behind the cottage. Upstairs there is the master king sized bedroom above the living room,. with great views of the fells to the front and back. There is also another good sized double bedroom and a twin room, both with stunning views towards Hartsop Dodd and the other local fells. There is also a family bathroom upstairs with a shower over the bath, a basin and WC. Please note that all bed linen is provided but towels are not. Outside there is ample parking for at least three cars. 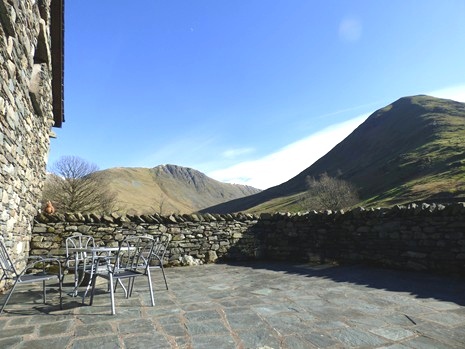 There is also a patio area with table and chairs, with panoramic views of the fells. Please note that our bookings are from Saturday to Saturday. We offer short breaks subject to availability, and offer discounts for couples - please contact us for details. Dogs are welcome at an additional cost of £25. We live next door so are close by if needed. Please note our booking terms and conditions. To check availability or to make a booking at our family and pet friendly Lake District self catering cottage please contact us. Living room with open fire, colour television and fell views to both sides. Modern fitted kitchen with dining area, containing fridge/freezer, microwave, electric cooker, washing machine, dishwasher and dining table and chairs. 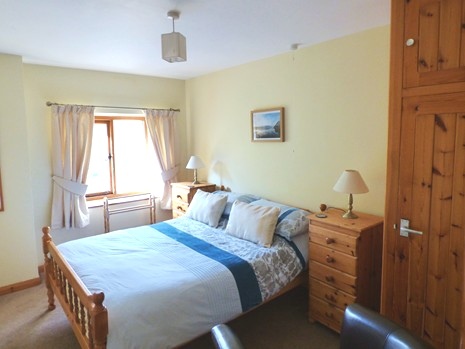 Sleeps 6 in three good sized bedrooms - one king size, one double & one twin. A cot is available. Bathroom with shower over the bath, basin and WC.